Solar Impact Yacht has revealed initial details of its first ocean-going solar powered yacht ahead of the concept's office unveiling at next month’s Cannes Yachting Festival. 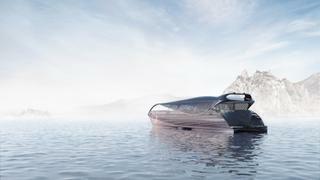 The 23.9 metre aluminium yacht is the result of five years of research by the Swiss company which claims it has realised its vision of a "seaworthy solar yacht with futuristic modern aesthetics.” Visitors to the Cannes festival will have the chance to explore a virtual 3D model of the solar yacht. The company said it has confronted the issues of high noise levels and rough seas by installing systems that rely on the sun as their primary power source. Meanwhile, the rolling and heeling of the yacht will be reduced by up to 90% thanks to the yacht’s SWATH (Small Waterplane Area Twin Hull) technology. The two torpedo-shaped buoyancy hulls, which sit under the water surface and support the ship, enable the yacht to “glide almost silently without swaying, even over waves several metres high,” according to Solar Impact. 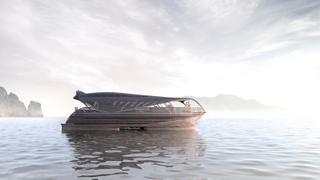 The yacht, which has a 9.9 metre beam and solar surface stretching 300sqm, will have a top speed of 20 knots. Meanwhile a diesel aggregate ensures the yacht can operate even in long periods of cloud cover. Accommodation is for 10 across four double guest cabins and a master suite. The yacht is also equipped with crew accommodation.